Finally it was possible. The television gave people the way to entertain guests that they had always dreamed of. Drop by our place, take it as it is, let’s have a nice evening and please come back soon. 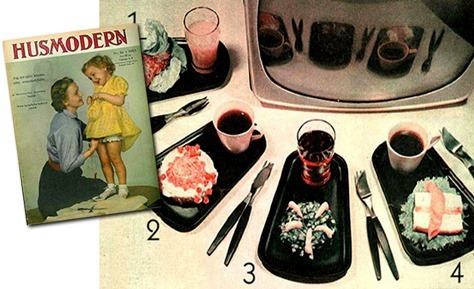 The simplest kind of food was just right, it could still look both inviting and delicious. 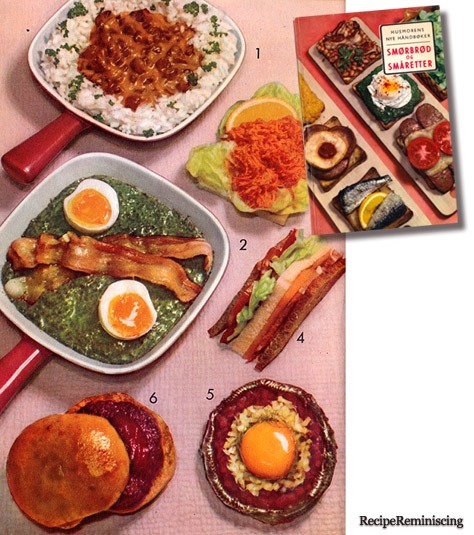 Here are some great recipes for a nice TV evening from 1959. Add glamor to budget meats with a golden garnish of cling peaches, baked, broiled, or heated in a sauce- pan … hot ding peaches are that ‘something different’ you’ve been looking for! And heating really brings out the tangy-sweet flavour of the fruit. Remember, only clings will hold their flavour, sunny colour and plump shape during heating. The peach, Prunes Persia, is a deciduous tree, native to North-West China, in the region between the Trim basin and the north slopes of the Kunlun Shan mountains, where it was first domesticated and cultivated. It bears an edible juicy fruit also called a peach. The species name Persia refers to its widespread cultivation in Persia, whence it was transplanted to Europe. It belongs to the genus Prunes which includes the cherry and plum, in the family Rosacea. The peach is classified with the almond in the subgenus Amygdales, distinguished from the other subgenera by the corrugated seed shell.